So post Christmas I'm going to be ordering a 6s or 6c and was wondering if the 6s is worth the extra money and why you think it is or isn't. Thanks! Both are good razors. However, I think the 6s may be worth the incremental money. It will be a razor that will last you for a very long time. You will definitely enjoy it. The main difference to me is the feel of the handle... something about the 6c handle is a little slippery at first, as there was probably an oil/lubricant used during manufacturing, and it takes a while to wear that layer away. The 6s handle has perfect traction right out of the box and is just better grip overall (... but the 6c will probably catch up and feel the same after some more use). For me, no question, there is no better deal on razors than 6c... I think everyone should have one, for travel at a minimum, if not your daily driver. BTW - I have NOT ever dropped the 6c. I have both and while the shave is similar I prefer the feel of the 6S in my hand. Also, the packaging of the 6S is better and you get 100 Rockwell blades included (Which I promptly gave away after trying one blade ). Great info! Thanks for your input. (12-22-2017, 12:30 AM)Rhinehoth Wrote: I have both and while the shave is similar I prefer the feel of the 6S in my hand. Also, the packaging of the 6S is better and you get 100 Rockwell blades included (Which I promptly gave away after trying one blade ). Hahaha, thanks for your input! I'm leaning towards the 6c since I can use the unspent money on something else to feed my addiction! I have shine and matt surface 6S. Here it is. (12-29-2017, 08:51 AM)am8119 Wrote: I have shine and matt surface 6S. Here it is. firstly, it seems important to remind you that my skin is not particularly sensitive but that I have the hair rather thick and hard. I usually look for combos rather effective. However, for having practiced the Merkur Futur (in the past), I do not look for aggressive razors anymore. This rockwell 6S is truly a revelation, first because it allows each of its owners to choose their own comfort / efficiency pair, but also because this razor is my only safety razor with which, or even on the high plates (4 and 5 tested today), one does not feel the blade (or almost) during shaving. This razor is great, it is not my eyes a soft razor (sweet going hand in hand for me with lack of efficiency unfortunately), but more of a razor permissive and protective of our skin. It is clearly with this safety razor that I get the best shave level results. I still can not get a death BBS, but after only 4 shaves with this razor, I intend to further improve my technique in the neck and chin. Side taken in hand, this razor is very nice, with a super grip side handle, also rather short, which I would have criticized normally and quickly put aside for the benefit of another handle but that does not bother me absolutely not on this rockwell 6S. In accordance with what I said at the reception, if it were to remain an DE at home (alongside my General Brass), it would undoubtedly be this Rockwell 6S. I finally found what I was looking for: an efficient & comfortable razor. I have to say, the 6s was a "revelation" razor. It is the one that led me to steel, and I will always love it if only for that. 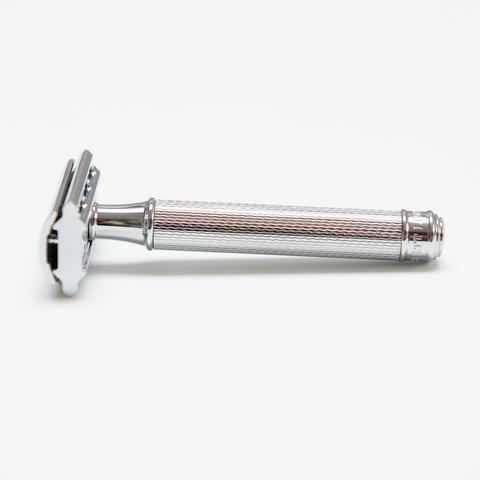 It also has the added bonus of being an incredible shaver, and its weight gives me superior performance to the 6c. Both for the weight, but also for the price ... especially these days, my choice would be the Rockwell 6C. After comparing specs of Rockwell 6C and Mayur Patel (Drone115b) Xydra x6 ... now I'd go for the 3D printed one. More range, more light weight, more saving. Moderator Note: Links to websites not affiliated with TSN removed. I'd like to add the same comparative table (Gillette Fat Boy / Karve / Rockwell) in here too. But BBCode is not active for that tool. Sorry, the link was to help, without commercial intentions. The 6C is a nice weight and works fine - when it works. The thread on my handle went so that put it out of action pending a new handle. I didn't get any response from Rockwell, though I pointed out in all fairness that I got it used (though it worked at first), so I just left it. So much for zamak. I don't trust any threads made of zamak, so the only part of the 6C that is any good to me are the base plates which are fine. They can be mated up with a lot of brass or SS top caps and handles so all is not lost. But in any case I moved on to Fatip open combs which are brass and shave better anyway. I prefer Rockwell 6C for many reasons. Only aesthetics I find it awkward. Fortunately there is now the Fawcett FC.6C with a more refined finish. I think there's a slightly higher price, especially when looking at classic European-style details (Muhle). (Yesterday, 03:25 AM)ischiapp Wrote: I prefer Rockwell 6C for many reasons. Oh yes, I've seen that before. It has the standard handle of Muhle. I prefer the 6S. The material used and the looks are a couple of reasons.